The two beautiful teenagers above, are 18 year old Olivia and her sister Ella, who is 16 (holding my little girl Willow, who is 2 - and needs that afro attending to!) They are my friend's daughters and I pretty much always love what they wear. BUT of course a large part of their wardrobes consist of items I would never dream of attempting myself, like short shorts and lace crop tops. When Livvy and Ella agreed to take me out and style me, I promised I would absolutely try on anything they picked for me. We started off in K-mart and it wasn't long until hilarity ensued- all three of us in the family changing room, laughing as we tried to get photos without hitting passers-by with the changing room door. The 70's has been a big trend this summer and the first thing Ella grabbed for me was a pair of flared jeans. I have been a skinny jean girl so long I looked horrified. But of course I tried them, and I couldn't believe how flattering they were! Ella styled them wth a lace top and a flower crown and Liv styled them with a brushed cotton shirt tied at the waist. Ella also chose to tie the shirt around my waist over the tee that Livvy had picked. Lesson 1: Try a style that is completely out of your comfort zone- you just might love it. 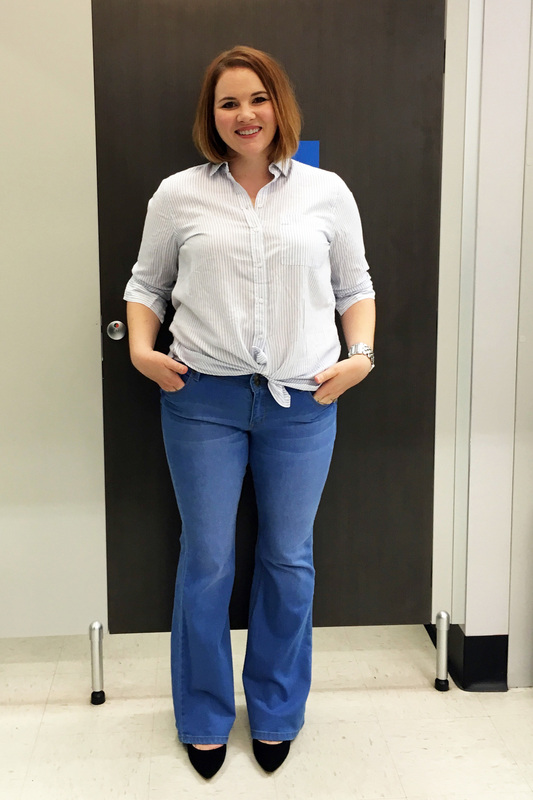 I loved those jeans so much I bought them - did I mention they were $9!!! K-mart, Style on a budget! The whole outfit cost less than $40. The jeans are a size 16 and all three tops are a size 18. I dare you to come back for Part 2 of this blog series to see me trying on ripped white high waisted jeans, fur vests and crop tops! Know someone who would love to shake up their style (or who would never let their teenagers dress them!?) Click SHARE below. Copy Cat- Straight Off the Model!